New Release! 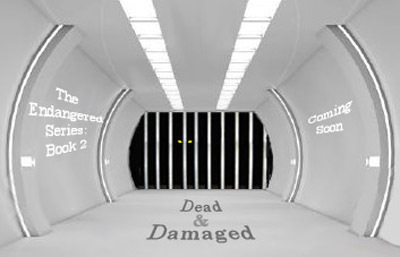 Dead & Damaged Now Available! Additionally I’m offering free copies in exchange for reviews – just fill out this form. Please add/rate/review it on Goodreads! Dead & Damaged Coming in 2016! Book Two of The Endangered Series picks up with Lori attempting to track down the source of stealth technology rogue vampires are using to hunt humans. Her pursuit leads her into the arms of a government agency with similar objectives. A temporary alliance is formed in an effort to stop the corporation responsible for putting the technology in malignant hands. Their mission goes awry, however, and leaves Lori with more enemies than friends. Her situation worsens when Marcus learns that the corporation has also been working with vampires to develop daylight suits and synthetic blood. He convinces his clan that this organization and its infinite resources could be a valuable asset in the evolution of their kind. They begin questioning Lori’s motives and Marcus takes the opportunity to capitalize on their distrust. Consequently, Lori soon finds herself on the run from her former clan and turns to Vega for help exposing the truth behind Marcus and his new deceitful allies. Need a refresher? Read the Epilogue from Book 1 here. Preview: Chapter 1 of Dead & Damaged! 2015 has been very good to The Endangered thus far! Already read it? Please take a moment to leave a review. I’d greatly appreciate your feedback. Reviews are a HUGE HELP in spreading the word to readers about a new book; especially one by a new, unknown author.